The client Husqvarna wanted to celebrate and honour the love for the forest that’s shared by many users of their products. 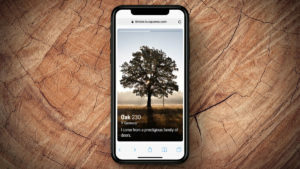 So for 2019’s Valentine’s Day, Stendahls created Timber – a dating service matching tree lovers with beautiful trees around the globe. 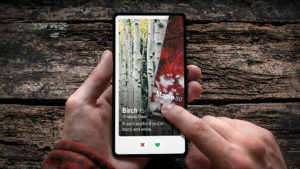 Timber is a tongue-in-cheek spoof of modern dating services: instead of swiping between lovesick singles, the user is presented with different trees that each have their own profiles. Once matched with a tree, it becomes apparent they don’t speak any human languages. Instead, trees such as California Redwood (bragging about its size), and The Ol’ Pine (sharing mindfulness quotes) only respond with emojis relating to forestry and flowers. Apart from the obvious humoristic flirt towards the world of online dating, Timber gives attention to Husqvarna Chainsaw Academy, an online resource aimed at responsible forestry. After a pitch late 2018, Swedish agency Stendahls won the global Social Media account for Husqvarna Forest and Garden, and Timber is the first achievement to be launched by the team.